Home / Columns / Which players could the Knicks draft following the NBA Lottery? The Knicks know exactly which pick they’ll have in June. The ninth best team overall gets the number nine pick. Sounds about right. Now comes the hard part for Steve Mills, Scott Perry, Gerald Madkins and new coach David Fizdale, who were all at the Draft Combine in Chicago last week. Those four key figures, along with members of the coaching staff, have been involved in some intense research, interviews and analysis as they try to work out a Draft strategy that can build on the promising elements of the current roster. Even the most optimistic Knicks fans would admit that, at best, they are a season or two away from a postseason appearance, and it would take something stunning at the Draft to dramatically shift New York’s position in the online betting markets with Stakers. However, the foundations are there for Fizdale to build something special. General manager Perry has said that their approach will be to pick the best player available. However, he has also hinted that they probably won’t be going for a guard. That’s not surprising. The roster already has three point guards. Trey Burke and Emmanuel Mudiay have potential, and it is still possible that Frank Ntilikina could develop into a franchise player. Tim Hardaway Jr., Courtney Lee and Ron Baker make up a strong-looking shooting guard contingent. This isn’t to say that if by some strange circumstance, Collin Sexton became available, the Knicks wouldn’t grab him, but assuming that doesn’t happen, it’s pretty clear where they need to strengthen. They desperately need a wing player, and above all, they need be longer and more athletic on defense. A solid forward who can also shoot would fit the bill. Which players are likely to be on the Knicks’ radar when the Draft gets underway? Here are five lively contenders. Mikal Bridges ticks all of the boxes. The 6-7 Villanova star is long, athletic, solid in defense and can shoot. As the only upper-classman in the lottery, he has a physical advantage over the other picks and he knows how to win. Bridges led Villanova to two NCAA titles in the space of three years, and has the maturity, size and frame to slot straight into the small forward role from the first day. He is also likely to be able to play different positions, so would add a welcome level of versatility to the roster. If he’s available, he’ll surely be their first choice. Of course, you need a plan B in every Draft, and if they miss out on Bridges, the Knicks could use their number nine pick on Wendell Carter Jr. The Duke forward is definitely more of a rough diamond than Bridges, but he’s bigger, at 6-11, and as well as being able to shoot, he’s pretty versatile, having played at power forward and center. Carter Jr. wouldn’t be a bad call, though there is a question about his defensive ability. Beyond Bridges and Carter Jr., predictions become a little more speculative. Michael Porter Jr. would certainly be a risky acquisition. The 6-10 forward only played three games as a freshman at Missouri. He was closely scrutinised at the Combine, and if he did enough to impress in his physical work, he could be on the Knicks’ list. One of the most intriguing possibilities could be Miles Bridges. Bridges is more of a power forward than a small forward. He won’t satisfy the Knicks’ need for a forward who can shoot, but he has the kind of hustle that can energise a team, never gives up, and pulls off some spectacular dunks. Sure, he’s far from the finished article, but there’s plenty of raw material to work with, and though he doesn’t tick all the boxes, he could end up a fan favourite. Kevin Knox would be a great offensive forward pick. He’s an excellent shooter and can score off the dribble and in catch-and-shoot situations. His versatility and his speed in transition should also count in his favor, and after playing under John Calipari at Kentucky, he will be more NBA ready than most in the Draft. His defense, though, is something of an unknown quantity, and he will need to work on it. The Knicks face a tricky scenario at the Draft. They need more defense, and their ideal pick would be a long, physical forward who can shoot. However, they are not so close to being the finished article that they can afford to overlook other possibilities. Expect them to stay flexible and take advantage of whatever comes their way in the number nine slot. ← Previous Story What does the Fizdale hire change? 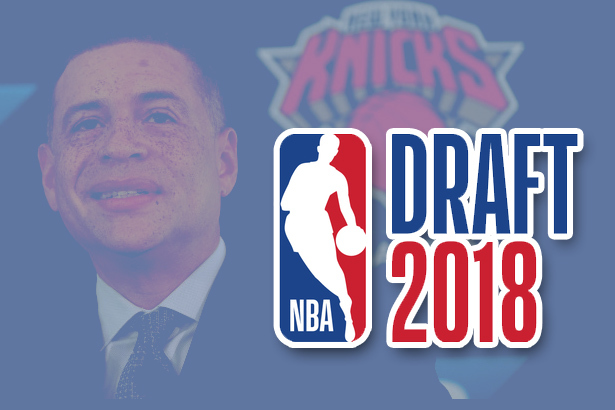 Next Story → Who Will the Knicks Select in the 2018 Draft?